Want to know how you can improve your golf swing quickly and gain an unfair advantage at the same time? Even since witnessing a presentation by the Austrian Ski Team’s biomechanics, I’ve been fascinated with how to get someone to improve a physical skill. It’s simply not enough to tell someone what to do, you have to tell them how to do it. And in all probability you will need to force the individual to learn the skill. The problem is that humans resist change. We have an inbuilt safety system that ignores instruction to make adjustments to motor skills. This is important with many tasks. After all, it would be no good at all if we quickly changed our walking style only to realise it was no good. This resistance to change protects us from losing vital skills that we rely on for survival. Unfortunately the same stubbornness applies to your golf swing. Making a swing change is virtually impossible – especially if you’re relying solely on the spoken word. If someone asks you to do something (like swing more uprightly) you will almost always revert back to your normal swing . No change will be made. The Austrian scientists identified a number of areas where improvements could be made to technique. But they didn’t stop here. They worked with a number of skiers and developed a range of drills and exercises that forced the athlete to integrate the new skills. The scientists used the WHAT to come up with the HOW. This is the difference between getting bogged down with information to actually making meaningful changes. This is of vital importance if you’re serious about making any change. No longer is it good enough to bombard the golfer with data, results and info – there needs to be a blueprint on HOW. I knew from a golf biomechanical study that there was a component of the swing that separated good and bad golfers. It was termed the flat spot. The golf flat spot ensured the club head and club face traveled along the target line for a longer amount of time. When a golfer achieved the Flat Spot Principle their golf swing improved. The result? With a longer flat spot your ball finds your target more of the time. The better the golfer the longer and more consistent the flat spot. So how do you improve your flat spot? This is an important question. Traditional methods will have you reading about it and maybe studying it on video. Unfortunately this is not enough. If reading or watching about proper technique was all it took we all would have excellent golf swings and be better players. The Flat Spot occurs when the club is traveling at its fastest. It is impossible for any human to have the feelings and sensations to control the club head during impact. It’s just not possible. Trying to do so inhibits the swing and causes the golfer to over analyse, get tight and most likely make a poor swing. The best swings happen when they are free flowing and natural. There can be no room for self-doubt or fear. All golf swings need to be uninhibited to the extreme if they’re going to be successful. And this is where most problems start for golfers trying to make changes. They disrupt the learning process (and the swing) because they are applying too much conscious thought. As much as we think we’re able to apply logic and thought to the learning process – we can’t. Once I learned about the Flat Spot Principle I knew I needed a way of teaching it. I messed around for a bit and eventually settled on a gate system. If a golfer could swing between the gates – they naturally achieved the FSP. From here the BetaGolf Swing Trainer was born. 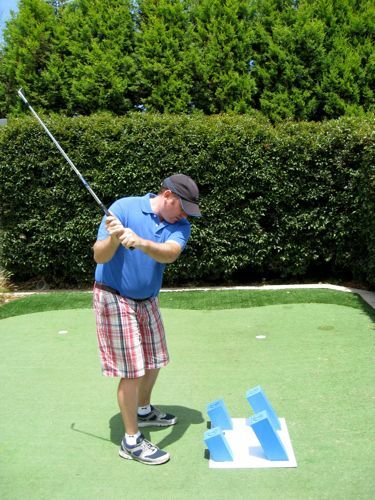 The BetaGolf Swing Trainer works because it allows the user to learn a vital fundamental (the flat spot) without inhibiting the learning process. 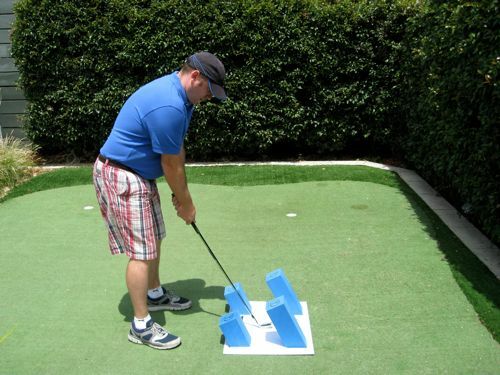 The user is forced to learn a better swing or they hit a sponge. It’s this feedback that allows improvements to be made at the subconscious level. When you strike a sponge you get instant feedback. 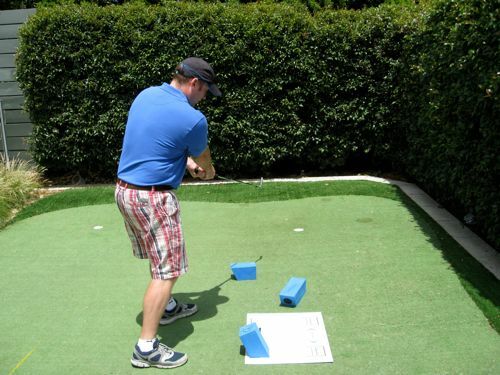 This allows you to make adjustments to your swing at the subconscious level. The golfer naturally sets up squarely to the ball. A square stance is important. Nothing new here but many golfers address the ball with a stance that is too closed or open. 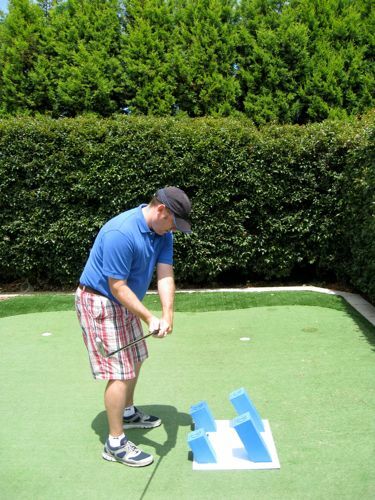 Setting up squarely makes it easier to make a successful golf swing. Now we’re getting into the good stuff. A perfect back swing is one where the hands start the motion and the body follows. This sets up the perfect chain reaction with the club going back on plane. Too much instruction gets the body turning too early. This is a byproduct of “big muscle” thinking and it has devastating effects. Over turning early in your back swing makes achieving a good swing harder than it needs to be. 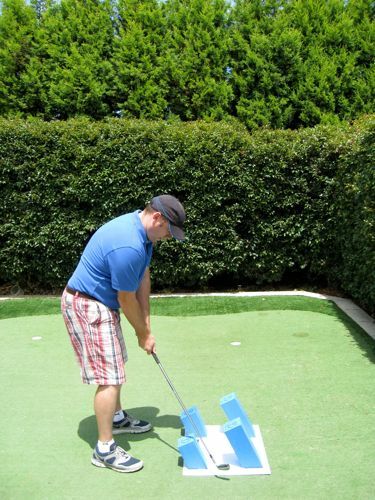 Move the club back between the sponges (without touching them). Your hands lead and the body follows – if you can do this your back swing will be absolutely perfect. The main point here? Anyone can do this. The simple objective makes learning a good take away as easy as possible. The ideal back swing is one where the hands lead and the body follows. Once you’ve made the take away it is then a natural progression to the top of back swing position. Science has shown that a good back swing should be a comfortable position, no need to wind like a spring or to make a big back swing. A comfortable position is far easier to do (less strain and stress) and sets you up to make a successful downswing. So if you think you need a huge shoulder turn and a big back swing think again. It’s here that the swing trainer really starts to perform its job. Once you’ve made your back swing it’s time to start the club down towards the ball. Many golfers start the motion by spinning their body. This is not correct and leads to the club coming over the top. The result? A dirty slice. 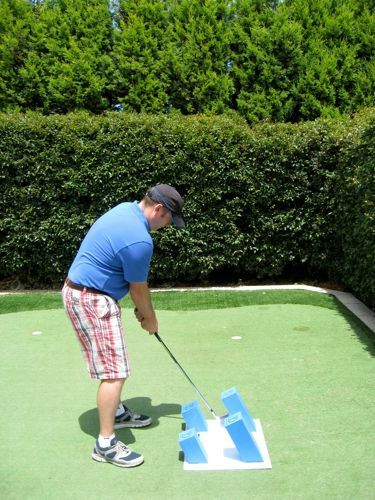 The good news here is with the swing trainer you’ll hit a sponge. Now if you’re normal you’ll start to get sick of doing this – replacing the sponges becomes annoying. So bit by bit you’ll stop spinning. The club will approach the ball from the correct path and you’ll start hitting the ball with pure back spin. The ball will start to go straight! Best of all you don’t need to think about lots of technique. With the objective of “get the club between the gate” your natural learning system will take care of the rest. If you hook, shank or block the ball the result will be the same. You’ll hit a different sponge but in time your learning system will react and stop doing it. 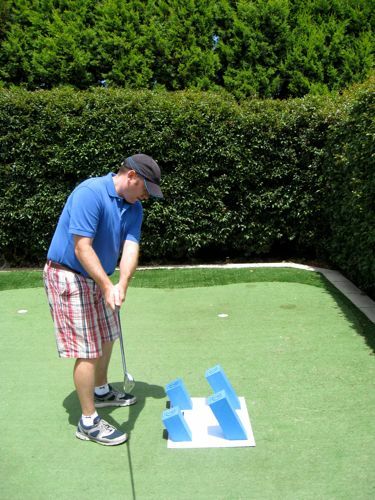 I don’t know of an easier or better way to improve your golf swing. This is the moment of truth. If you get this right the ball will find its target. And the key part of impact is achieving the Flat Spot Principle. The FSP ensures the club head and club face travel along the target line. When you do this you’re putting back spin on the ball and no side spin. So your ball flight will naturally be longer and straighter. Another aspect is that by swinging the club through the foam gate you’ll also more likely strike the sweet spot. This only helps the ball finding the target. The club achieving a flat spot. The ball will travel longer and straighter. The Beta Golf Swing Trainer works because of its simplicity. There is nothing technical or complicated to remember – you make your best swing you can and attempt to swing the club between the sponges. When you make a good swing you don’t hit anything. When you strike a sponge you get instant feedback – you’re then able to learn naturally and instinctively. You can increase or decrease the difficulty by moving the sponges. It comes with four set levels. All up learning to obtain a flat spot (or increasing its length) gives you a mechanical advantage. Golf is a difficult sport and any advantage is a good thing and something all golfers should strive for. If learning to improve your golf swing and gaining the confidence to go with it interests you, then please consider the Golf Trainer. Longer and straighter shots – they have pure back spin on them! 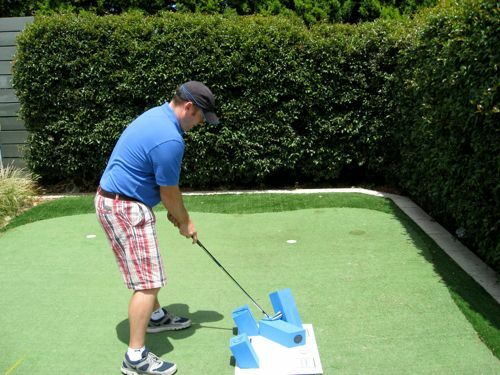 Learn more about the Beta Golf Swing Trainer here. By using this training aid would it also help build a better total balanced swing? As I was explaining to you my biggest problem I believe is automating a consistent balanced swing. I have a tendency to hook but also slice the golf ball. If you have a good balanced swing I believe you would have a better chance to tap into what you believe your natural swing is? Would be keen on anybody elses thoughts on this? @ Ray: A balanced swing is a result of playing automatically. Your subconscious makes sure your balance is a priority. Conscious thought disrupts the process. However, learning to swing through the gates would assist. The flat spot allows you to swing with confidence (because you are minimising side spin) and confidence is always a good thing. So far Cameron you are the only one that’s open minded enough for conversation. Although I still only have one student and the reason probably is that I don’t have a name known to people and I still have not advertised in golf magazines. However, the first thing I do to the student when teaching a certain aspect of the swing is to tell him the function(s) of the move. THE ONE PIECE STRAIGHT TAKEAWAY IS TO ESTABLISH THE PIVOTAL POINT OF THE BODY JUST BEHIND THE MIDDLE OF THE STANCE AND IT HAS TO BE STRAIGHT SO THAT THE TRANSFER OF THE AXES OF THE HIPS FROM THE B ACKSWING TO THE DOWNSWING IS ALSO STRAIGHT , OTHERWISE YOU WILL HAVE AND ERROR OF BALL DISTANCING IN THE SWING.WITHOUT THE TAKEAWAY THERE IS A TENDENCY FOR A REVERSE PIVOT AND TOO MUCH TAKEAWAY MAY HAVE A TENDENCY FOR A HIP SPINOUT. ERROR IN BALL DISTANCING(UPPER BODY AXIS TO THE BALL) IS WELL ILLUSTRATED WITH THAT BASKETBALL PLAYER’S SWING. Interesting idea. I’ve been studying golf since 1956 and have played pretty well at times. There seems to me only one sound idea of the golf swing: the body moves laterally and the club swings from the hands. A golf swing is no different from a baseball swing in this respect. Stand with your feet separated, the outside edges beyond the width of your hips. If you are very flexible you can try standing wider. In any case, position most of your weight over your front leg. Start the club handle first, move to your back leg and use your hands (both of them) to swing the clubhead up over your back shoulder, keeping your hands low. Don’t try to turn your hips or shoulders or extend your arms. Don’t try to coil. Don’t worry about the length of your backswing. It doesn’t matter except that it must be naturally your own. When you feel the clubhead is up, move your weight laterally so that your front hip is moved forward of its starting position, and use your hands to swing the clubhead down and through the ball. Try to drive the ball under an imaginary bench positioned across your target line. You may find it helpful to look at the front edge of the ball rather than the rear edge. This promotes a downward strike which is what golf requires with all clubs, even the driver. It is possible to use just the rear hand in the downswing, which is most natural to those who are rear eye dominant. You need some resistance in your back leg during the backswing, and you get this resistance from bending your knees and deliberately keeping the back knee bent as you move and swing back. It is the lateral motion of your weight that both creates a flat spot in your swing and generates power. Although you don’t want a fast lateral move you do need a big lateral move and will have to force yourself to become comfortable with making it. You will feel your head move in both directions. You will be criticized for that by idiots addicted to golf magazines. Ignore them. You will destroy power if you swing the club too fast, particularly if you apply arm speed. This will prevent your weight from moving forward. One of the best swings to watch is that of George Knudsen, which is easy to find on the internet. Just watch his swing and don’t listen to his explanation, the same thing you should do with any great golfer. Nearly all of them play by feel and are unable to explain what they actually do. This is particularly true of Ben Hogan. You can ruin any chance of good golf by studying his damn book. I know because I did it and ended up being a lawyer instead of the golfer I wanted to be. don’t listen to his explanation, the same thing you should do with any great golfer. Nearly all of them play by feel and are unable to explain what they actually do. This is particularly true of Ben Hogan. It’s hard to use words to describe what we do – our language isn’t descriptive enough so it’s always a compromise and learning this way is hard. This is why I always encourage golfers to get outside and play the game, to explore, learn and have fun.